If you find this bit tricky, you have every reasons to be sceptical about which shade to choose, considering the shades that are customary for a Maharashtrian bride to wear. 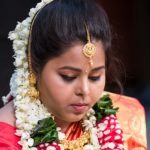 Green, plum, and a few more shades are more common than any other, and one can only decide on a shade of eye makeup when they know of the exact shade the bridal outfit. For a safer option that is bound to go perfectly well with every saree shade, a bit of red and gold shimmer can highlight the eyes with a bit of kohl, mascara, and eyeliner to go with it. While an airbrushed look is often opted for by brides, a simple look is both appealing and beautifying. Highlight the cheeks using a little rough or mousse, and finish it up with shimmery gold that gives the bride’s face a glow. A burnished bronze is another shade to opt for when highlighting the cheekbones. 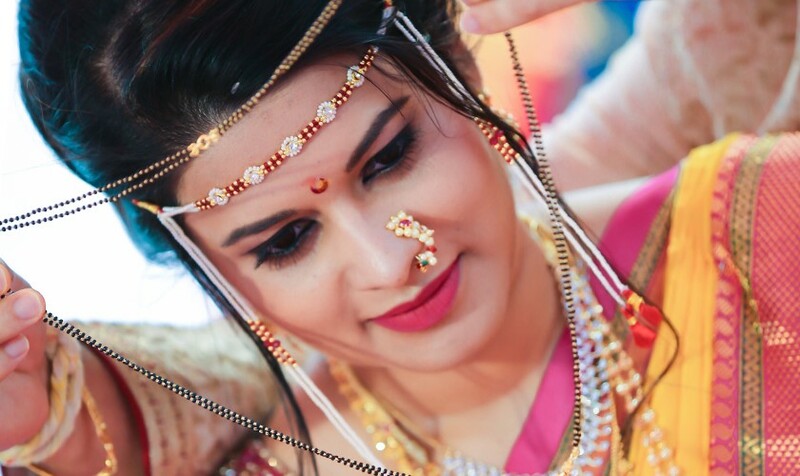 Since Marathi makeup is often simple, brightening up the look with a little colour on the lip is a great idea. Go for shades such as maroon, red, or plum that highlight the shape of the lips and add to the beauty of the bridal look. A light shade of brown is sure to have an equally enthralling effect. 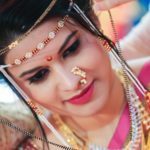 While you can always experiment with the look if the bride is up for it, the appeal is sure to be more charming with a simple look.